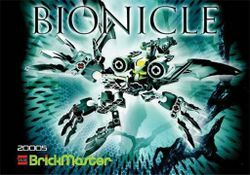 20005 Klakk is a BIONICLE set released in 2008. It came with the September/October 2008 issue of Brickmaster Magazine. It contains 38 pieces to construct a Klakk, which is a winged Rahi. Klakk are winged Rahi native to the Matoran Universe. They can produce powerful sonic screams which destroy shadow. Takanuva used them to cure the Shadow Matoran of Karda Nui. This page was last edited on 9 January 2016, at 03:27.